Do you want the love and companionship of a dog, but have only limited time to commit? Want to test drive a dog for the weekend before adopting? Want to make a difference in the life of an animal by having a weekend sleepover visit and letting us know what a dog is like in a home to help them find their perfect family? If you have answered YES to any of these questions, the MADACC Weekender’s program is for you! Studies show that animals who have breaks from the time spent in in a shelter have lower stress levels, maintain their potty and training skills and are happier adoption candidates. For humans a weekend companion gives you the opportunity to bond with a loving dog, reduces your own stress levels, but, most importantly, you can help an animal get adopted much faster and help us make better matches. You only have to fill out one application and can participate in the program as much or as little as you like. One weekend, or several! The commitment is up to you! 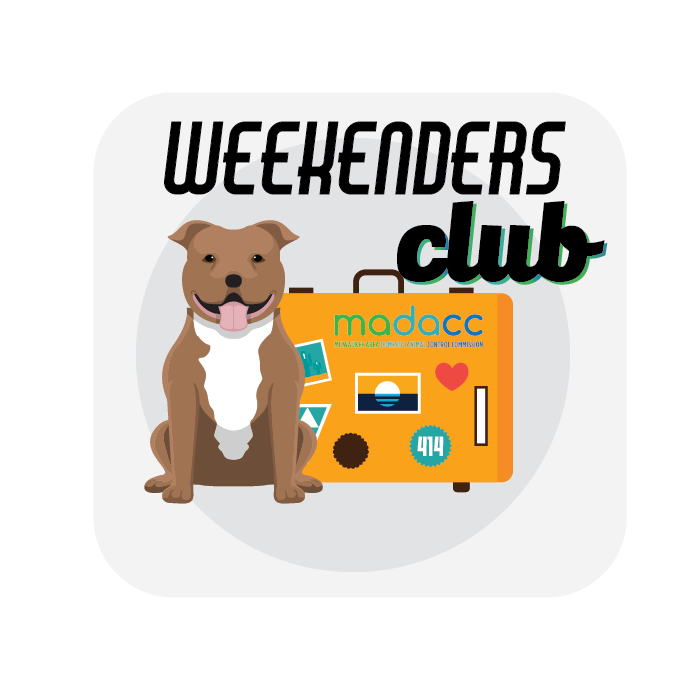 Here at MADACC we are really excited about the new Weekenders Program. Today we are talking the Adoption Outcomes Manager and MADACC’s Medical Director about the program. You will be able to select from the available weekenders and make a reservation to come into MADACC to pick up between 5 – 7 Friday night. MADACC will send home a collar with ID, harness, leash, dog bowls, a foldable crate, food and whatever else the dog will need for the weekend. We do request a $75 deposit that is refundable with the supplies and the dog are returned on Sunday. All dogs will be fully vetted when they leave, including sterilization. Reservations are made on a first come first served basis. Fill out this waiver at home before you come in to expedite your pick-up! You will need to have a new waiver each time you pick up a dog for the weekend. You will also receive a packet with an agenda to help you have the best weekend possible with your friend. We will require a minimum of 5 digital photos and a 30 – 90 second video when the animal comes back as well as some questions that can be filled out online so we know how the weekend went. On Sunday, arrive between 8am – 10am or 3pm – 4pm to return your weekend guest, or if you would like to adopt we can do that instead! If you adopt, your deposit will be put towards the adoption fee. If you would like to purchase the supplies, we have a package price available for you to keep it all. Otherwise, stop in to the front desk, return the animals supplies and the paperwork and then you can do it again another weekend! Check out the Weekender Foster Handbook for more information. MADACC will be here for your whole weekend visit in the event of questions, concerns, or emergencies. The Weekenders Program is available to Milwaukee County residents only. 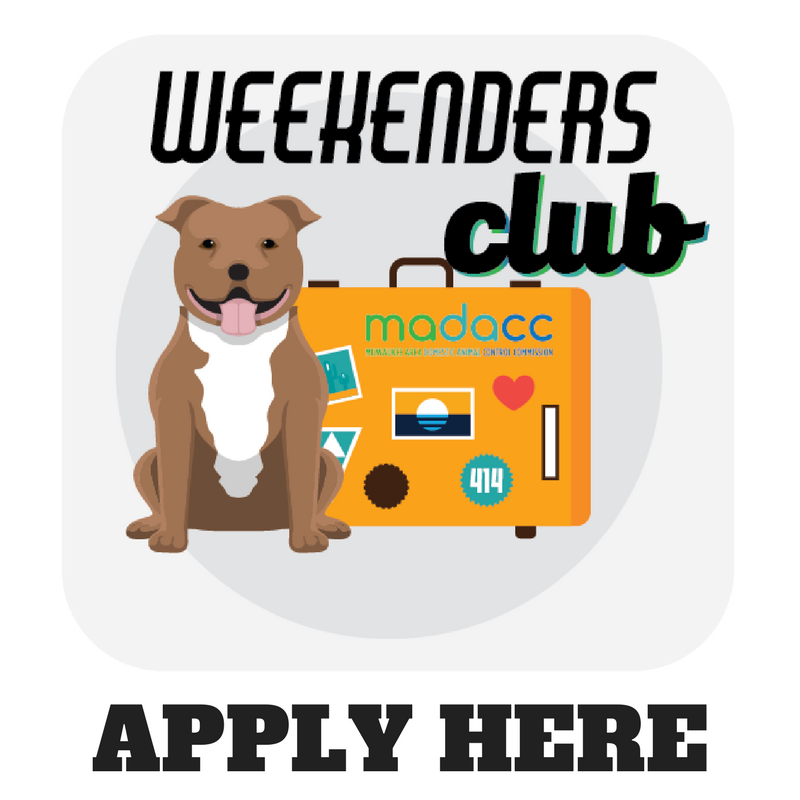 Are you a dog-friendly business that would like to have Weekender fosters and dogs visit you? Contact Kathy at kshillinglaw@madacc.org for info and a free sticker to put on your front window!